The leaders of Division 1 the Royal Oak took on bottom club The Webb in very good game, despite the Webb losing. The Webb created a couple of early half chances but it was the Oak who took the lead in the 12th minute when James Henry scored from close range. They doubled their lead in the 20th minute when Josh Goodwin hit a 30-yard strike that flew into the bottom corner. A minute before the break Lee Thomas made it 3-0 when his edge of the box shot riffled into the top corner. Minutes into the second half the Oak won a corner and Wes Klopper headed the cross past a flapping keeper to make it 4-0. The Webb, despite being four down, never gave up the ghost and battled to the finish. There were 15 minutes to play when Ross Irvine connected with a rebound off the cross-bar to make it 5-0. Club manager Alan Bloomfield came on with ten minutes to play and with virtually his first touch he fired in No.6 after the Webb failed to clear a cross into the penalty-box. 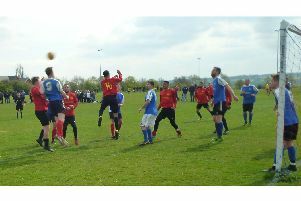 The Webb did well against their opponents who are looking to win the league title for the first time. The challengers Lawford and CRC met on Sunday and Lawford had taken a 2-0 lead by the break. Just after they restarted, CRC pulled a goal back before equalising from the penalty-spot. With five minutes to play Lawford hit the winner. The Barley beat Athletico Bellbao 4-0, Oleg Stroi, Rob Littlejohn, Lee Golding and Jamie Cross getting the goals. In Division 2 leaders Griffin beat Braunston 5-1. The Griffin led 2-0 at the break. In the second half they went 3-0 up before Braunston pulled a goal back through Andy Fincham to make it 3-1. The hope of a comeback was soon squashed as The Griffin fired in two goals in a matter of minutes to clinch this one. Lewis Fairgreaves, Mikey Hall, Adam Hartwell, Jack Curtis and Kane Maunder scored for the Griffin. On the Rocks Quigleys drew 2-2 with the Royal Oak Res. Coyle Hughes and Patrick O’Brien scored for On the Rocks and Stacey Bennett and Dean Paine replied. The Holly Bush and Avon Mill fought out a 4-4 draw. Clifton Bulls travelled to Wolston to give the Malt Shovel a 19-1 drumming. Danny Riddell hit six, James Sweeney four, while there was hat-trick for Matty Wells, a brace each for Matty Lewis and Ollie Hartnack plus singles from Brandon Smith and Shaun Lewison. Cup fixtures for March 13: On the Rocks v CRC, Clifton v Prince of Wales, Webb v Royal Oak, CRC Res v Royal Oak Res, Avon Mill v Barley Mow. League fixture: Athletico v Lawford. It is the league’s intention to run an Over 35s league during the 2016/17 season. Any clubs interested should contact Stuart on 07805 127399.